Scan just a few message boards dedicated to Buffy the Vampire Slayer and/or the spin-off show Angel, and it won’t be long before you find die-hard fans pinning their hopes on wooing the former casts into made-for-TV movies, film adaptations, or even a new series. With this TV season seeing the return of many veterans from both series committed to completely unrelated shows, it seems likely these dreamers will have to keep on dreaming. Comic books are, for now at least, the last vestige for those seeking new stories in the darkly humorous and engrossing world Joss Whedon created. Every now and then the creators grace the panels with their own unique touch. Such is the case with Tales of the Vampires. The stories are told by Roche, an ancient vampire captured and imprisoned by the Council of Watchers - the clandestine group that trains watchers to oversee the Slayers. As part of their training, young children destined to become watchers are exposed to the demon and forced to listen to grim tales of vampires from the past and future. As is to be expected in a book producing a mixed bag of creators, the quality is just as mixed as the names. Many of the stories are worth the time, but Buffy fans might be surprised at the relatively serious tone of the book as a whole. It starts out strong with three great stories from Jane Espenson. "Spot the Vampire" is a disarmingly cutesy tale that, with a rhyming narration and wonderfully cartoony art by Scott Morse, quickly makes you forget how many times the word "vampire" appears in the title of the book. "Dust Bowl" gives us the story of a vampire in the dark expanse of Kansas during the Great Depression rendered utterly barren under Jeff Parker’s care. An avid Buffy watcher myself, I’ve often enjoyed debates with my girlfriend regarding how rigid the rules of morality are when it comes to vampires. Buffy canon dictates most vampires are soulless and so can never be good, but those with a soul - like Angel - are able to make moral choices. I’ve always argued that the actions of some of the vampires prove this rule wrong, and that it was never intended to be set in stone. Espenson proves me right in "Father", Roche’s first tale to his young, captive audience. After a man is transformed into a vampire, he returns home and upon seeing the face of his baby boy, is unable to kill him. The brief story follows the father and son’s life until the bittersweet end, and it’s perhaps the most touching chapter of the book. It’s surprising that all three of Espenson’s contributions, while quite good, are largely humorless considering she’s credited on some of the most well remembered humor-heavy episodes of Buffy, such as "Band Candy", "Gingerbread", and "Superstar". "Jack" by Brett Matthews is another re-telling of the murders of Jack the Ripper, which initially suffers from the fact that, well, it’s another re-telling of the murders of Jack the Ripper. It’s saved, however, by some great art from Vatche Mavlian and a secret twist handled with surprising subtlety. "Dames", a largely colorless and noirish story, is Matthews’s most impressive addition to the trade, made that much better by Sean Phillips’s art. "Numb" is his last and utterly forgettable contribution, chronicling the tired tale of the ongoing guilt of Angel, soulful vampire. Whedon’s own "Stacy" explains the allure the world of vampires holds through the eyes of a teenage girl. It’s a good and solid story, though it feels unnecessary. Do the kind of people who can recite whole seasons of Buffy scripts need to be told why the idea of becoming a super powerful creature of the night can seem tempting? The least fulfilling chapters come from Drew Goddard, credited as writing for Buffy in the show’s last season. The season suffered, among other things, the writers’ tendency to fall back on old ideas that were originally innovative but seemed petty when rehashed. Not surprisingly Goddard does the same with his work in Tales of the Vampires. Fans of the show may remember in the first episode featuring Spike and Drusilla (Season 2's "School Hard"), the pair mentioned they had just journeyed from Prague where they were attacked by an angry mob. "The Problem With Vampires" tells the tale of the attack and the duo’s escape. The story is told through the second-person narratives of the characters involved, and Goddard seems to have little grasp on either Spike or Drusilla’s voices. Further, since the two are separated through most of the story, it features none of the decadent chemistry that made the pair so fun to watch. And while artist Paul Lee does a spot-on Spike, his Drusilla looks nothing like the series’ character, but rather a generic pale girl. "Antique" is a sequel to the season 5 opening episode "Buffy vs. Dracula" and does little more than repeat everything that was funny about the episode on which it’s based. Ironically, I found out after reading the trade that my favorite story, "Some Like it Hot", was not only written by a guy who’d never worked for any of Whedon’s various shows, but it’s actually the only published work I’ve managed to find by him. 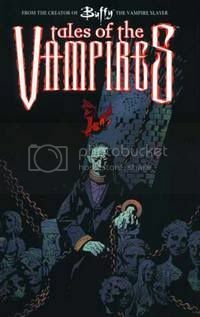 The short, funny tale about a vampire who may or may not have found a shield against sunlight is scribed by the late Sam Loeb, son of Jeph Loeb who died earlier this year. The rhythm and ending feel something like the shorter Mignola Hellboy stories, and in a collection that was getting much too serious for its own good, it was a welcome change of pace. The trade ends with the larger story of the vampire Roche and the young watchers-in-training, with a bit of a surprise twist. Unfortunately, the surprise does little more than confuse the reader at first. Without giving too much away, the effect of the surprise depends largely on the era during which the Roche/watchers story takes place, and the reader is never told what era that is. The confusion is compounded when, upon realizing the timeline, you realize that all but one or two of the stories Roche has told took place after he was telling them. As an attempt to link these stories into one cohesive piece, Tales of the Vampires clearly fails. But depending on how attached you are to the Buffyverse, the bright spots might be enough to justify the $15.95, particularly with work by artists like Scott Morse, Sean Phillips, and Tim Sale involved.